Little Alfie in his sister's room. Wild Horses at Mission Butte. Pine Ridge Indian Reservation, South Dakota. Vietnam veteran Tony Bush looks over his service awards. AIM (American Indian Movement) members set up a post 2-miles from the border of Whiteclay, NB. Members of AIM (American Indian Movement) at an outpost on the border of Whiteclay. Whiteclay, Nebraska lies on disputed land, merely 200 feet from the official reservation border, and less than 2 miles from the center of Pine Ridge, South Dakota, the largest town on the reservation. Prior to 2013 the sale and possession of alcoholic beverages on the Pine Ridge was prohibited under tribal law. Except for a brief experiment with on-reservation liquor sales in the early 1970s, this prohibition has been in effect since the reservation lands were created. At the time this image was taken, Whiteclay had four off-sale beer stores licensed by the State of Nebraska which sold the equivalent of 4.5 million 12-ounce cans of beer annually (12,500 cans per day), mostly to the Oglalas living on the Pine Ridge. 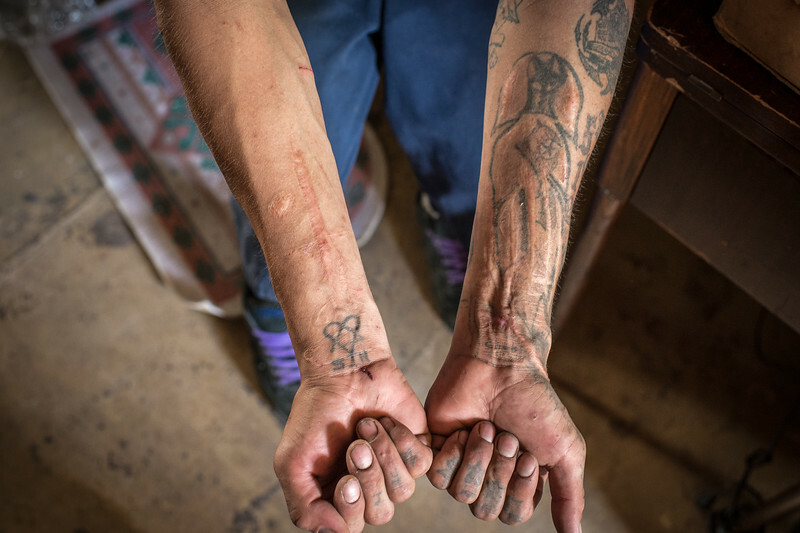 Suicide attempts mark the wrists of this Lakota teenager. Children watch on as their uncle collects water from a nearby stream in preparation for the second sacred Lakota rite, the Inipi; the rite of purification. The Inipi (Sweatlodge) is the second sacred Lakota Rite. Inipi means "to live again” and it is the rite of purification. This particular rite is done before any significant undertaking to cleanse the mind and spirit. The Inipi rite will help the vision seeker to enter a state of humility, thus undergo a spiritual rebirth of sorts. The Crazy Horse Ride is an annual event held in early June by members of the Oglala Lakota Sioux tribe of the Pine Ridge Indian Reservation in Pine Ridge, S.D. In 2007, the Veterans' Powwow celebrated its 22nd year of honoring all armed-service veterans with drumming, dancing, and singing. A three to four day event, it also features a Saturday parade and daily specials and tributes to veterans and soldiers in active duty. In 1998, Charles Brewer founded the Crazy Horse Ride, to take place just before the Veterans' Powwow, to honor the great Oglala Lakota Sioux warrior chief, Crazy Horse. Brewer also wanted to express gratitude for warrior culture and to pay tribute to all war veterans. The four-day horse ride begins in Fort Robinson, Nebraska, where Crazy Horse was killed in 1877, and it terminates in Pine Ridge at the grounds of the Veterans' Powwow. About 200 people typically take part in the ride, many of them children and young people from the Pine Ridge Indian reservation. A sacred Buffalo (Tatanka) is bled during a Releasing of the Spirit Ceremony 2-days before Sundance, which is one of the Seven Sacred Rituals of the Lakota. Because of the Tatanka’s great importance to the Lakota, a buffalo symbol or skull is present in all sacred Lakota rituals. The Tatanka stands as a symbol of self-sacrifice, as it gives until nothing is left, a trait that is found in the Lakota warrior. The Sundance signifies the cycle of death and rebirth. This ritual is performed as a sacrifice to help keep the world in balance and to ensure health and happiness within the tribe. Moses, the grandson of a Lakota medicine man harvests the Y shaped "man" which will mark the entrance to the Sundance circle. Dorothy Sun Bear lives in a small trailer on the Pine Ridge Indian Reservation. Since the untimely death of her oldest daughter, Dorothy helps care for 8 children, three of which are her own. Her monthly income is $623 from a disability check. As a life long resident of Wounded Knee, she flies her American flag upside down which signifies a nation under distress and also in defiance towards the U.S. government for not honoring the Black Hills Treaty of 1868. Pow Wow competition at the Pine Ridge Casino hotel. Pine Ridge Indian reservation, South Dakota. A Wacipi (Pow Wow) participant. Each summer, thousands of Native American peoples across the country celebrate their connections to tradition, spirituality, the Earth and to one another, in a social, personal and spiritual meeting: the Pow Wow. For many, these gatherings are an integral component of the Native American existence. 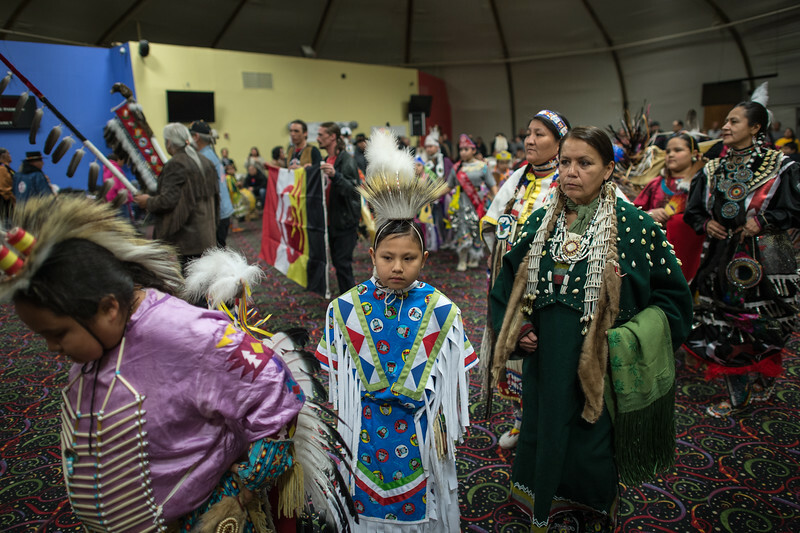 More than a homage to a great ancestry, the Powwow is an event of contemporary significance for the individuals and communities making up the hundreds of Native American nations.